In this context, CSF-Brazil conducted a study on the management of mangroves ecosystem services. The goal of this study is to sensitize the government and society to the benefits these ecosystems provide, and make recommendations about economic instruments that could be used to promote the sustainability of protected areas with mangroves. 3) elucidation of how economic instruments can benefit the conservation of mangroves. 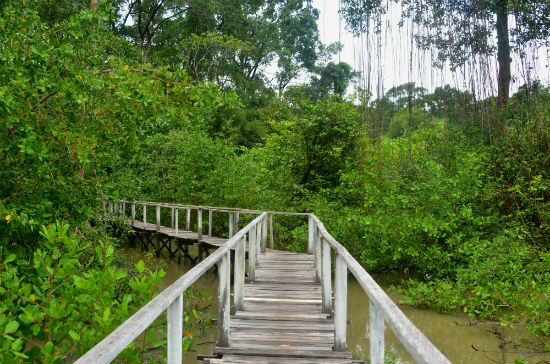 Footbridge leading into the mangrove area in Soure, in Pará state. Specifically, we estimated the values of ecosystem services provided by mangroves through the Value Transfer method in the case of the Salgado Paraense region in Brazil's northern coast, where one of the largest mangrove areas in the world is found. The stock of fisheries in mangroves is being threatened by the use of predatory fishing techniques and the protection of mangroves is hindered by important institutional deficiencies of the PA, thus threatening local communities whose food security depend on mangroves. To find ways to address these challenges, we reviewed the policies that use economic instruments for mangrove management and highlighted successful examples in several countries, including the Seguro Defeso and Bolsa Verde programs in Brazil. Through this research and discussion, we hope to contribute ideas for improving the configuration of economic instruments, with the ultimate goal of mangrove conservation and sustainable use in PA. This study was supported by the United Nations Development Programme (UNDP) with Global Environment Facility (GEF) grant financing in the scope of the GEF Mangue (Project Mangroves from Brazil), and was conducted in partnership with the Chico Mendes Institute of Biodiversity Conservation (ICMBio) / Brazilian Ministry of Environment / Brazilian Federal Government and the Brazilian Fund for Biodiversity (FUNBIO). Please, click here to download our full study; here for more information about this project; and here to read about our field trip for data collection.